I’ve thought about that a lot, Christine, and I do think covers matter. I think they need to get the reader’s attention and draw the reader in, without being lurid – a tricky balance. And that book about the Christie covers looks fantastic! Lucky you to have gotten it. Yes, I agree, a tricky balance. I really enjoyed the book and was reminded of some wonderful Christie covers. Hope you are having a good summer. Yes, thank you, Helen. Some covers make you want to buy the book almost irrespective of the content. Will look forward to seeing this one. Could you describe it very briefly and I could look it up online? I’m curious! This is a topic dear to my heart. I do care very much about book covers and I have bought many books solely because of the covers. This would apply mostly to vintage paperbacks, however, and I usually won’t apply the same standards to contemporary fiction because of the reasons you have mentioned. I do buy a lot of old paperbacks featuring seductive women who have nothing to do with the plot because the I like the artists who created the covers. It is true that there are many novels with those covers that have nothing to do with seductive women in any state of dress. 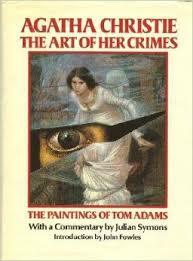 Tom Adams’s covers of the Christie books are my favorites also and I have two books of his cover art. But I have had some trouble getting some of the paperback copies. Moira has sent me a few postcards with illustrations from those covers, and I will continue to pursue them. On another topic: The last book I finished reading was your most recent book, Deep Water, and I enjoyed it a lot. I loved reading about the world of pharmaceutical research and the characters were very convincing. Now that you mention it, I have no objection to covers in vintage paperbacks featuring seductive women and enjoy their over-the-upness. Thank you for telling me that you enjoyed Deep Water. I am so pleased. So nice for me to feel it was such a successful present, I’m delighted that you liked it so much! I do love those Adams covers – as Tracy says, I like the postcards of the covers too. Covers ARE important, it’s not trivial or shallow to think so, and they can be very helpful. I have bought books because of covers, I have laughed at ridiculous and inappropriate ones – and I’m dying to look at the one Helen mentions above. I’m going to have to look it up online! I loved it! So much agree with you. Yes, we must know about that book cover – but there are several and I am not entirely clear which it is.